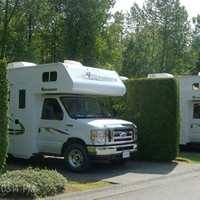 To celebrate their 35th anniversary, Voyager RV Centre has announced the launch of the Voyager Cares fundraising initiative, with the goal of raising $100,000 for local charities. 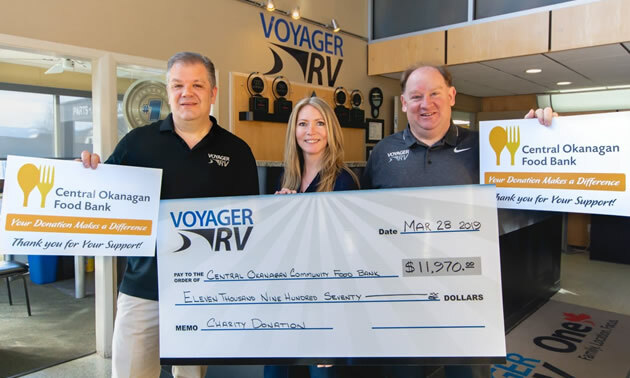 The campaign kicked-off in December and over the next 12 months the family owned and operated dealership has committed each of its departments to donate proceeds from every RV sale to 7 different non-profit organizations throughout the Central Okanagan. The first check presentation took place at the end of March, with a donation of $11,970 made to the Central Okanagan Community Food Bank. Providing food services to between 100 and 150 households every day, Tammie Watson, the revenue development officer with the organization, says this donation will go a long way in helping stock their shelves during the slower donation period typically seen during the summer months. To celebrate their 35th anniversary, Jason Friesen, son of owner/president Rodney, knew he wanted to take it to the next level and show support in a new way, which is what led them to the $100,000 fundraising goal, the release stated. “I thought it was a great time to give back in a way we never have before. When I took it to my Dad he was onboard from the very beginning, without hesitation. He was excited! It’s about making a difference within our community in a way that’s rarely seen from family-owned RV Dealerships”, says Friesen. The Voyager RV leadership group reached out to the over 60 team members in helping select the 7 charities they felt most passionate about supporting throughout the campaign. The list includes The Central Okanagan Community Food Bank, BC Heart and Stroke Foundation, Alzheimer Society of BC, BC Cancer Society, Mamas For Mamas, ALS Society of BC and the Kelowna Women’s Shelter. For General Manager Ward Fraser, involving the staff was key in not only selecting the charities, but creating engagement, excitement and passion that extends beyond their work place. “The Friesen family has always shown a dedication towards creating an amazing culture within the Voyager Team. This initiative takes it one step further. It’s really created an excitement that’s inspired each and every employee to be their very best and to challenge themselves every day in a way that meets and exceeds our customers expectations”, says Fraser. The entire Voyager Team will be part of check presentations throughout the year to present the donations and personally thank the charities for the amazing work they do within the community and the continued impact they have for those in need. 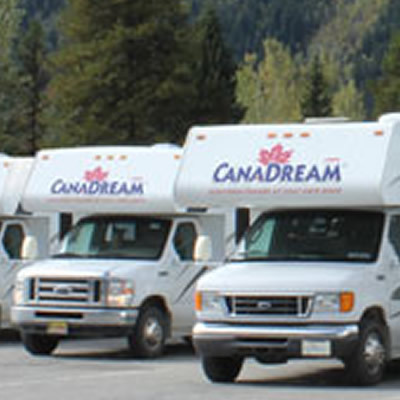 CanaDream Corp sold to Australian-based Apollo Tourism & Leisure Ltd.
Apollo is a multi-national, vertically integrated manufacturer, rental fleet operator, wholesaler and retailer of a broad range of RVs in Australia, New Zealand and the USA. 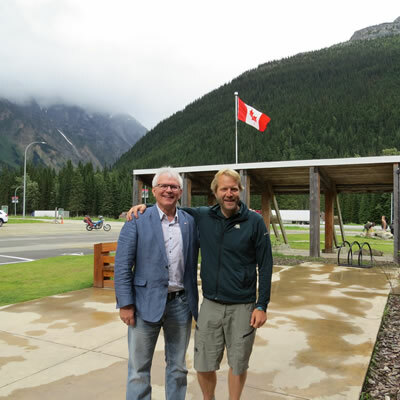 MP Wayne Stetski slammed the Liberal government for a plan that would see the selloff of up to $8.3 billion worth of Parks Canada infrastructure.